I love coffee. Like a lot. I like to change up my coffee making methods from drip method to French press to using those coffee pods or capsules. Sometimes I like to drink it black and other times I like to add a little flavour or sweetener. How do you make/like your coffee? It’s true, I need it to function in the morning, during the midday lulls, in the evening, especially when I haven’t had the time (i.e. procrastinating on writing up a new blog post) and just need to get things done. That and dark chocolate. Ohhh… or chocolate covered coffee beans (get the peaberry beans if you can)… so good. Okay, but back on point. 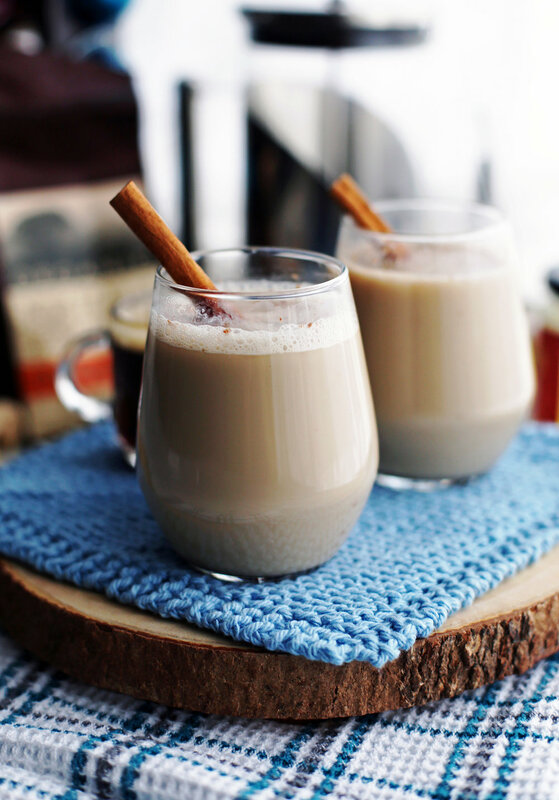 This coffee drink, or more specially, a latte (or caffè latte or cafè au lait), which is coffee made with hot espresso and steamed milk, and translates to “milk coffee”, is my simple recipe for today. I spruced it up with delicious, warm, sweet, and spicy flavours. All the ingredients for this simple stove-top latte! Amounts and full instructions down below in the recipe card. Remove the cinnamon stick and ginger before pouring into a cup. For this recipe, I like to use unsweetened almond milk, which has a light nutty flavour to it. However, what makes it so dang tasty is the addition of cinnamon, ginger, and honey. The fresh chopped ginger and cinnamon stick (substitute for ground cinnamon if you want) is whisked with the almond milk as it heats up on the stove to infuse the flavours into the steamed milk. These ingredients give the drink a lovely sweet and spicy flavour that just warms you up from within. These three ingredients are said to have the health benefits of being an antioxidant and having anti-inflammatory properties too. This hot drink was amazing to have when I was trying to ward off my never ending cold for last couple of weeks. Plus you get the caffeine boost from the strong espresso (and a little sugar high from the honey too) that’s great to have when you need a little pick-me-up in the morning or during the day. It’s easy and fast to make. This recipe is made straight on the stove-top with a whisk to get the milk hot and foamy. I make an espresso with my coffee maker that uses capsules, but make it whatever way you prefer. In a pinch, you can use instant espresso or instant coffee. Just add it straight to the almond milk mixture in the first step. In a small saucepan, at medium heat, add in the almond milk, ginger, and cinnamon stick. Whisk continuously until hot and foamy, about 3-4 minutes. Remove from heat and stir in the espresso and honey until the honey dissolves. Remove the cinnamon stick and ginger (I use a small strainer). Pour into a cup and garnish with grated or ground cinnamon if you like. Enjoy!